Today I will share with you the recipe for Masala Papad/ Chilli Papadum which is a personal favourite and a great appetiser before any meal. I initially came across this fabulous concept when I first visited India in 1998 and have found that restaurants in India (especially Mumbai) have made this one of their welcome snacks! 1. In a bowl, mix together all of the ingredients (apart from the papadums) just before you are about to serve the papadums. 2. Top the baked papadums with the fresh, spicy, chopped vegetables. Don't leave the vegetables on the papadums for too long otherwise they will make the papadums soggy. So there you have it! A delicious new recipe for you to try! ... Please let me know how you enjoyed the masala papads/ chilli papadums! Today I will share with you the recipe for Banana and Fenugreek Pakoras / Kera Methi na Bhajiya. It may sound like a strange combination at first but trust me, once you try them, you will be hooked! 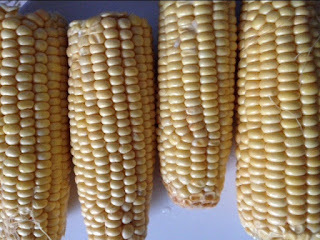 It's a great starter or a snack food for a picnic on a lazy day out in the sun. They are of course best eaten hot! This recipe will serve at least 2 to 3 people. 1. Mix all the ingredients in the order above in a dish apart from the oil. 2. 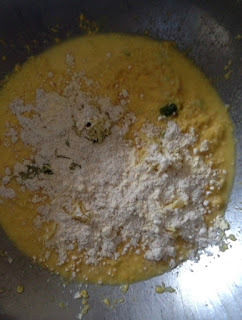 Only put enough water in the rest of the ingredients (listed before 'water') to ensure that the mixture forms a batter so that it can be dropped into hot oil to fry and form pakoras. 4. Remove from the oil and onto a plate; put some kitchen roll on the plate to help the oil to be further be removed from the pakoras. 5. Eat hot to enjoy them at their best. So there you have it! A delicious new recipe for you to try ... savour and enjoy the banana and fenugreek pakoras / kera methi na bhajiya! You and your friends will just love them! Today, I will be sharing with you the recipe for Sarson Ka Saag / Pureed Greens Soup (a green, leaf-based, pureed, thick soup) which actually is a staple dish in the Punjabi diet but it's one of my all time favourites so even though it is not technically a Gujarati dish, I will be showing you how my mother makes it. This recipe is packed with nutrients and is extremely healthy; it is traditionally served with Makki di Roti (unleavened Punjabi bread made of cornflour). 1. Place the spinach, mustard greens, fenugreek leaves and onion into a medium-sized, pressure cooker. 2. Add in the water and place on the hob. Put the flame on the hob to a medium-high flame so that the greens start to wilt. 3. Add in the rest of the ingredients from the list above, in the order above, from the garlic all the way to the green chillies. 4. Close the pressure cooker and cook until 3 to 4 whistles sound from the pressure cooker at medium heat. Make sure that the pressure cooker you use is big enough so that the contents of the cooker doesn't start to escape from the cooker when it is cooking and make sure that there is enough water in the pressure cooker so that the contents do no burn. 5. Once the greens are cooked and the 4 whistles sound, take the pressure cooker off the heat and let the pressure cooker cool down so that all the pressure from the cooker is released. This is very important so that when you open the pressure cooker, the contents of the cooker doesn't explode all over the kitchen and burn you. Only when all the pressure from the cooker is released is it safe to open the cooker. 6. Pour half the mixture into a jug blender and puree it until it is really fine. Then do the other half. The idea of doing it in two batches is so that the contents of the jug doesn't overflow when blending to a fine puree. 7. Put the butter into a frypan and heat at a low heat. 8. Add in the pureed greens into the frypan and turn up the heat to medium-high. 9. Add in the cornflour paste and stir well. 10. Simmer for 10 minutes on a low heat; this will thicken the pureed greens. 11. The Sarson ka Saag is ready to serve. So there you have it! A delicious new recipe for you to try at the weekend ... savour and enjoy the Sarson ka Saag! It's delicious and we eat it with chapatis (also known in Gujarati as rotlis/rotis). First of all Happy Ganesh Chaturthi to you all! Today (when I started to write this post - Friday 25th August, 2017) is a very auspicious day in the Hindu calendar celebrating our beloved Lord Ganesh who is known as the 'Remover of all Obstacles' and the God of Prosperity. This is the beginning of a 10 day festival in honour of Lord Ganesh (son of Goddess Parvati and the God of all Gods, Mahadev (also known as the destroyer of evil). Private households and communities get together to make Ganesh statues from clay and it ends with these (generally) massive statues of Ganesh being paraded through the streets in India with song and dance and then finally, immersed in large water bodies such as the sea or ocean. 1. Wash the drumsticks and cut them into 3 inch long lengths. Then boil them. Keep the water from boiling the drumsticks. 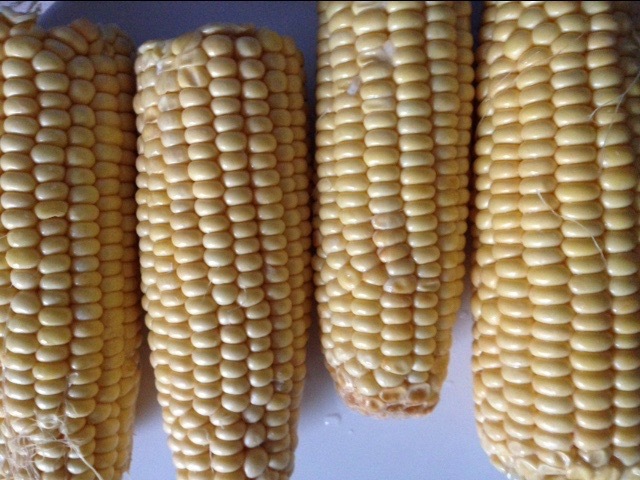 Once boiled, remove them from the water into a separate bowl to prevent them from over cooking. 2. Wash the potatoes and boil them well until you can easily pierce a knife through them and peel off the skins. Then cut them in half. 3. In a large saucepan on the hob, heat the oil on high heat and add in the cumin seeds once the oil is hot enough. 4. Once the cumin seeds start to brown and pop in the pan, add in the asafoetida. Lightly stir. 5. Then add in the chickpea flour and turn the heat to a medium-to-low flame immediately. 6. 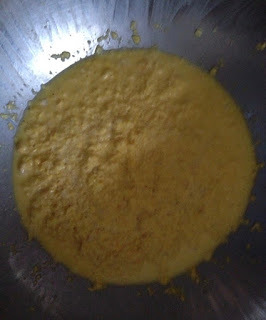 Stir the chickpea flour continuously until it starts to go a light pinkish in colour. 8. Add in the saved boiled water from cooking the drumsticks, the boiled potatoes and also the cooked drumsticks into the large saucepan. 9. Turn the flame to a medium-to-high heat (more on the high side) and stir well to combine the flour into the water to create a slightly thick gravy from the water that has just been poured in. 10. Add in the rest of the ingredients from the ingredients list above in the order shown. Mix well. 11. Turn to a low heat and cook on low heat for 15 minutes to simmer. You can cover the saucepan for optimal results. 12. Add in the 2 tbsps coriander at the end to garnish. NB: When you eat the drumsticks, it is only the inside part of the drumstick (not the tough exterior nor the seeds unless they are really soft) that can be eaten. Basically, the fleshy bit on the inside. Generally, people eat the drumsticks with their clean hands and scrap off the inner flesh with their teeth but first splitting the drumstick lengthways. So there you have it! A delicious new recipe for you to try ... savour and enjoy the shektani sing/saragva nu shaak! Dear Gujarati Food Made Easy Lovers! I wish you all a very Happy Indian Independence Day - India officially turns 70 years old today and we are also celebrating Janmashtami today, so Happy Janmashtami. Janmashtami is the day on which Lord Krishna (the 8th incarnation of Lord Vishnu - the preserver of the Universe) was proclaimed to be born to save the world from his evil, maternal uncle, Kaansa. Krishna was also pivotal in the epic 18 day war between the Kauravas and the Pandavas where he helped the Pandavas win this war of truth and righteousness over evil. This war was fought at Kurukshetra (now near modern day New Delhi) and was retold in the Indian epic, Mahabharat. 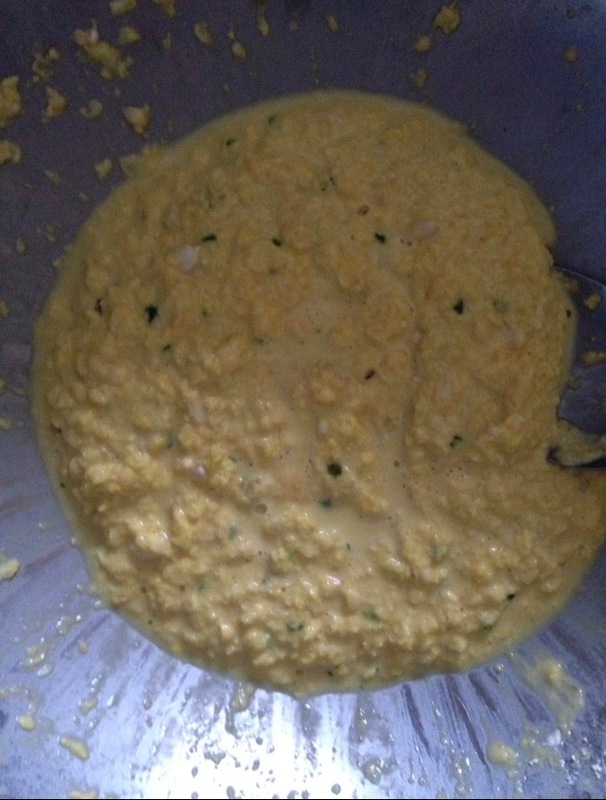 The mixture should be thick enough to be able to drop about a spoonful of this batter at a time to form balls in the hot oil. 5. Deep fry the batter placing it in the hot oil spoon by spoon to form the fritters/vada. Only put in enough batter to form the number of fritters/vada that you can manage to turn without burning them - I would recommend 4 or 5 at a time. If the wok is bigger and you are an experienced chef, I still would put no more than 6 or 7 at a time. 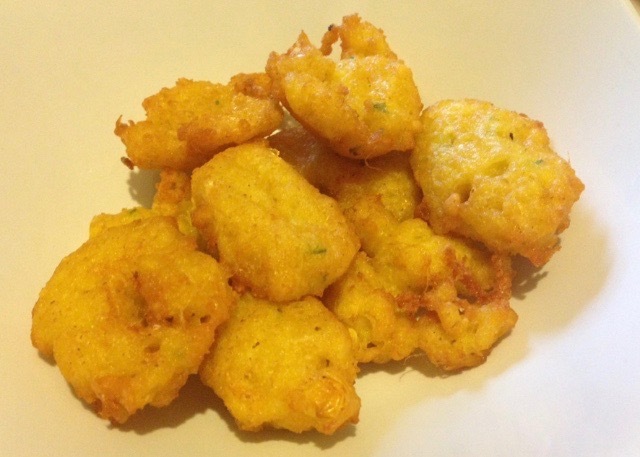 (If the fritters break up and don't stay together, add a tbsp of each of the chickpea flour and the wholemeal flour into the batter and stir well before trying to fry the batter in the hot oil to make them into fritters again. 6. 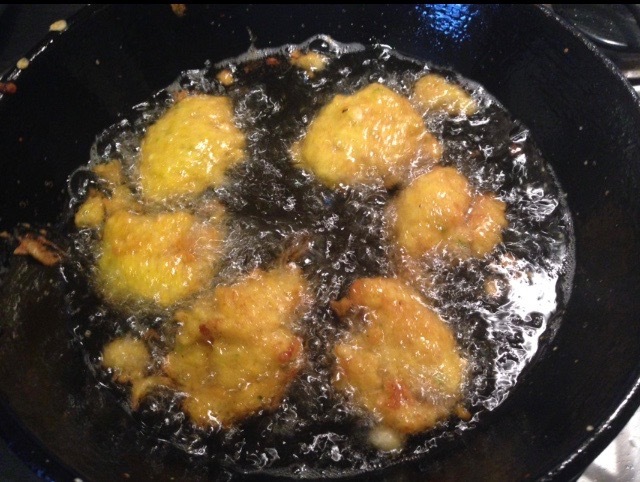 Once they are golden brown, remove safely from the hot oil and drain on some kitchen paper in a plate. 7. You can use extra kitchen paper to remove excess oil and serve hot with a squeeze of lemon juice. So there you have it; a delicious new recipe for you to try out! Let me know how it was :) Savour and enjoy! Many thanks! Today, I will share with you the recipe for lablab bean subze (otherwise known as surti papdi nu shaak) in Gujarat. The UK is very well known for being a great place to come across foods from all over the world and even then, I have found it difficult to come across the lablab bean (surti papdi) as it is an extremely seasonal vegetable (mainly found in Indian winter time) and pretty rare to find, even in the Asian grocery stores. When you do come across them in the shop, be careful as to how you select the beans. They generally come in pods that are a vivacious green and pods will be firm and of a velvety texture if they are of a good quality. You may also find that some stores in the UK will sell only the already shelled beans without the pods (to make your life easier), although it is safe to say that these may be of varying quality. As soon as you get home from buying the lablab beans (surti papdi), please refrigerate them immediately and cook and eat them as soon as you can so that you gain the best taste experience from them. 1. Pour the oil into a medium-sized pressure cooker and let it heat up. 2. Add in the papad khar, the asafoetida and the ajwain seeds and temper the ajwain seeds until they start to turn a golden brown colour. 3. Add in the surti papdi/lablab beans and stir well. 4. Add in the rest of the ingredients, starting with the turmeric powder in the order stated above in the ingredients list and mix well until all the spices have been evenly spread around the surti papdi/lablab beans. 5. Once you add the water and have mixed in everything, close the pressure cooker and cook the surti papdi on a medium-to-high heat until the cooker sounds at least 2 whistles. 3 whistles would be fine too. 6. Turn off the heat and make sure that the pressure from the pressure cooker has been released before opening the cooker. So there you have it; a delicious new recipe for you to try out and let me know how it was! Many thanks!